Please read our policies below. You are responsible for adhering to them. If our policies are disrespected, some additional charges and enforcements apply. The Desert Willow Ranch and its property is for Registered Guests only. The Desert Willow Ranch and its property is for Registered Guests only. NO SMOKING IN THE HOUSE AT ANY TIME – Smoking in the house will result in a $250.00 Sanitation Fee. NON NEGOTIABLE. We have provided ashtrays tins outdoors on the picnic tables for your outdoor use. Please be considerate of our grounds and not drop butts on ground. Extinguish cigarettes completely in the ashtray tins provided outside. PRIVATE PROPERTY – We have the right to refuse service to anyone. We reserve the right to remove anyone from the property deemed disrespectful, inappropriate, dangerous, negligent, breaking laws, or out of agreement as listed. Please be aware of turning off lights, air conditioning/heating and stove when not in use. TELEVISION, TELEPHONE AND INTERNET SERVICE - A television is provided which will play DVD’s only. AT&T cell phones get reception. A land line is provided for emergency calls. There is no Internet service. NO FIRES – San Bernardino County does not allow fire pits, fireworks, pyrotechnics, etc. No fires including candles (except for birthday cakes) are allowed in the house. REPORT DAMAGE – Damage or destruction to the property left unsaid results in fines. It is better to report damages in and outside to owner, than to leave for discovery. CANCELLATION POLICY – If you do not arrive on your arrival date and have not notified the owner, you will be considered a NO SHOW. Your reservation will be cancelled and you will be charged the full amount of your reservation; so please call and cancel at least 36 hours before cancelling your reservation to receive a full refund. PET/HORSES – We are pet friendly. Dogs – All dogs must be non-aggressive and non-barking. Please do not leave your pets in the house when leaving the premises. There is a secure, sheltered dog run with water in the back yard. There is a pooper scooper and rake available on the back porch you can use to pick up after your pet. Horses – YOU ARE RESPONSIBLE FOR YOUR HORSE’S SAFETY AND SECURITY. Please secure the corral gate properly. We provide tubs and water supply, you must bring your own feed. Please keep your horse at a walk on the property roads and town property. There is a locking tack room (same key as the house) to keep your saddles and tack in. 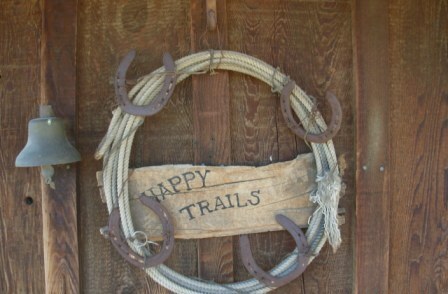 Please clean up after your horse, both in the corral and around the property. There is a rake and wheelbarrow available for your use. Please pick up after all your pets upon leaving and put in the dumpster on the property. EVERYONE RIDING A HORSE ON THE PROPERTY MUST FILL OUT THE HORSE RIDING AGREEMENT AND LIABILITY RELEASE FORM. Extra forms can be found in the top left drawer of the desk. UPON LEAVING – Please be sure your bedding is stripped from the beds used and used towels are put on the bathroom floor, anything in the refrigerator is dumped and you have checked to see that you have left nothing behind. There is a dumpster at the end of the road in front of the house to put all trash in. Please put any recyclables (only cans, plastic, and glass) in white plastic bags provided and leave on front porch. There is a check-off sheet on the desk to remind you of the above. USE OF ALCOHOL ON PROPERY – By signing the rental agreement, you are taking full responsibility for the use of alcohol on the property by you and your guests and hold Gay Smith and the Smith 2003 Family Trust not liable for any action(s) by you or any of your guest in connection with your stay.